1ـ هدفها: مدیریتوسازماندهی؛2ـ هیئت­علمی؛ 3 ـدانشجویان؛4ـدوره­هایآموزشیوبرنامه­های درسیوغیردرسی؛5ـ فرایندیاددهیویادگیری؛6ـ دانش­آموختگان؛7ـ امکاناتو تجهیزاتآموزشیوپژوهشی مورد بررسی و ارزیابی قرار گرفت. به­منظورارزیابیعواملفوق47ملاکو182گویهدرنظر گرفتهشد.هرکدامازاینگویه­هابااندازه­گیرییکیاچندمتغیرهمراهبود.پژوهش از نوع کاربردی است و در آن از روش تحقیق توصیفی ـ پیمایشی استفاده شد.ابزارهایمورداستفادهبرایجمع­آوریاطلاعاتشاملپرسش­نامه، مصاحبه، بازبینهوتحلیل داده­هایلازمبود. یافته­های پژوهش نشان می­دهد به­جز عامل هیئت­علمی، که در سطح مطلوبی قرار داشت، بقیۀ عوامل ارزیابی درونی گروه عمران دانشگاه ملایر در وضعیت مطلوبی قرار ندارد.به عبارت دیگر،دروضعیتموجودگروهدرسطحنسبتاًمطلوبقرارداشت؛ارتقای کیفیت گروه مستلزم رفع نواقص از سوی مسؤلان دانشگاه و برنامه­ریزان گروه است. Internal evaluation is a process of the study of the university system and quality of scientific groups by members of system that can make a surprising evolution in higher education. The aim of this study was to internal evaluate of Civil Engineering Department of Malayer University to develop and improve the quality of that department and provide solutions to its problems. For this purpose, after grounding the CIPP model components, to internal evaluate of this group, seven factor such as objects, management and organization; Faculty members, students, educational and non-educational training courses and curricula, teaching-learning process, graduates and educational, and research facilities was evaluated. In order to assess these factors 47 criteria and 182 items was considered. Each of these items was recorded by measuring one or more variables. This research is applied research and the descriptive - survey research method were used. The instruments used for data collection included researcher made questionnaires, interviews, checklists and necessary data analysis. It is tried to determine the current status of the department and the suitability of each item. The results showed that except of faculty members factor that was desirable, other factors of internal evaluation was not favorable in civil engineering department. In other words, the present situation of civil engineering department was relatively favorable. To improve the quality of the department, university authorities and department planners should eliminate the above-mentioned deficiencies. ایمان­زاده، علی (1394). مطالعه و ارزیابی فاکتورهای مدل ویک و لئون از دیدگاه اعضای هیئت­علمی در دانشکدۀ پزشکی دانشگاه علوم پزشکی همدان و ارائه راهکارهای بهبود آن. مجلۀ مرکز مطالعات و توسعه آموزش علوم پزشکی یزد، ۱۰ (۱)، ۲-۱۱. 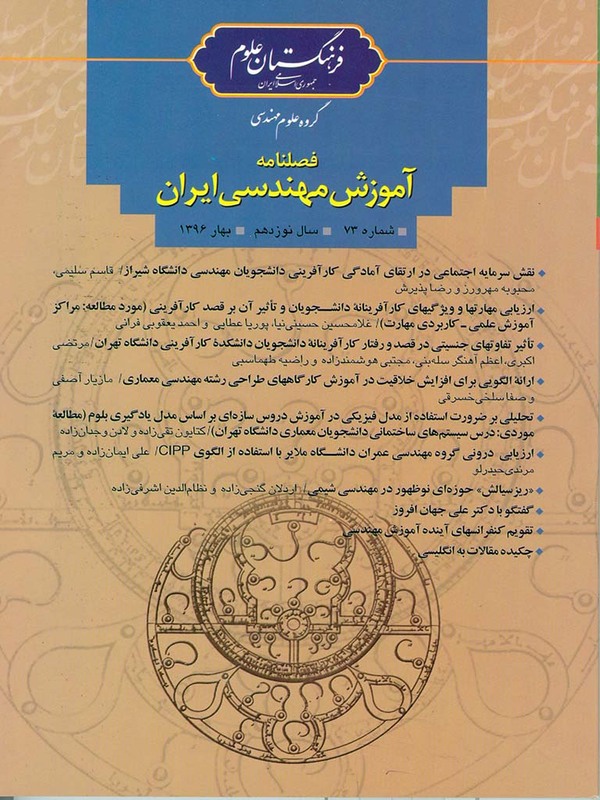 بازرگان هرندی، عباس (1392). ارزشیابیآموزشی:مفاهیم،الگوها وفرایندعملیاتی، چاپ هشتم، تهران: سازمان مطالعه و تدوین کتب علوم انسانی دانشگاهها (سمت ). خسروان و همکاران (1389). ارزیابی درونی گروه پرستاری بهداشت جامعه و روان دانشگاه علوم پزشکی گناباد در سال 1389­­، فصلنامهدانشگاهعلوم پزشکیوخدماتبهداشتیدرمانیگناباد، 16 (4)، 49 ـ 40. رفیعی، غلامرضا؛ خدادادی­زاده، علی؛ کاظمی، مجید؛ شهابی نژاد­، مریم؛ راوری، علی و بخشی، حمید (1382). ارزیابی درونی گروه پرستاری داخلی جراحی دانشگاه علوم پزشکی رفسنجان. نیم سال اول 82 -81 . مجله علمی دانشگاه علوم پزشکی سمنان. جلد 5 ، ویژه­نامه آموزش پزشکی. 17-9. برنامه­ریزیدر آموزشعالی، 49 ، 175- 145. نادری، ابوالقاسم و عبداللهی، حسین (1389). کارایی و اثربخشی ارزیابی کیفیت گروه‌های آموزشی دانشگاهی: چالشها و چشم­اندازها. مجموعه­مقالات چهارمین همایش سالانه ارزیابی درونی کیفیت در نظام دانشگاهی(دانشگاه تهران). تهران: مرکز ارزیابی کیفیت دانشگاه تهران. Bazargan, A. (2007). Problems of organizing and reporting internal and external evaluation in developing countries: the case of Iran. Quality in Higher Education. 13(3), 207 – 214. Cho, Y.; Park, S.; Jo, S. J.; Jeung, C. W. and Lim, D. H. (2009). Developing an integrated evaluation framework for e-learning. Handbook of research on e-learning applications for career and technical education: Technologies for vocational training, 707-722. Eseryel, D. (2002). Approaches to evaluation of training: theory & practice. Educational Technology & Society, 5(2), 93-98. Hakan, K, Sevalb, F. (2011). CIPP evaluation model scale: development, reliability and validity. Journal of Social and Behavioral Sciences, 15(1), 592-599. Keshavarz, M. (2011). Management development of internal evaluation in the Islamic Republic of Iran (case study). Educational Research and Reviews, 6(14), 804-811, 12 October, 2011. Avalable online at: http://www.academicJournals.org. Singh, M. D. (2004). Evaluation framework for nursing education programs: application of the CIPP model. International Journal of Nursing Education Scholarship, 1(1). Stufflebeam, D. L. and Shinkfield, A. J.(2007). Evaluation theory, models, & Applications. San Francisco, Jossey-Bass. Stufflebeam, D. L. and Shinkfield, A. J. (1986). Systematic evaluation. A self instructional guide to theory and practice. Kluwer. Nijhoff Pub . Tseng Kuo-Hung, C. Ray Diez, Shi-Jer Lou, Hua-Lin Tsai & Tien-Sheng Tsai. (2010). Using the context, input, process and product model to assess an engineering curriculum : World Transactions on Engineering and Technology Education . 2010 WIETE. 8(3). Vanhoof, J. and Van Petegem, P. (2007). Matching internal and external evaluation in an era of accountability and school development: Lessons from a Flemish perspective. Studies in Educational Evaluation, 33(2), 101-119. Worthen B. R. and Sanders J. R.( 1991). Educational evaluation: Theory and practice. Worthington, OH: Charles A. Jones Publishing Company; 189-95. Wollmann, H. (2006). 26 Policy Evaluation and evaluation research. Handbook of Public Policy Analysis, 393. Zhang, G.; Zeller, N.; Griffith, R.; Metcalf, D., Williams, J., Shea, C. and Misulis, K. (2011). Using the context, input, process, and product evaluation model (CIPP) as a comprehensive framework to guide the planning, implementation, and assessment of service-learning programs. Journal of Higher Education Outreach and Engagement, 15(4), 57-84.